I don’t know about all of America, but I, for one, run on Dunkin’. America’s probably just a tiny bit more reliant on fossil fuels than coffee and donuts, I think. But even though your individual daily drive-thru transactions may seem small, those $3-$5 charges can add up quickly. 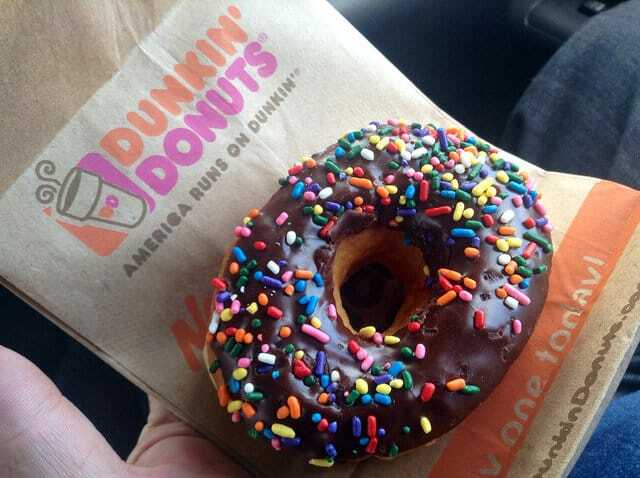 That’s why we put together this list of the best ways to save money at Dunkin Donuts. You can get your pre-work fix… without accidentally spending your entire food budget on Munchies and Coolattas. Here are six ways to save money on Dunkin’. You’ll get not just one, but three free beverages when you sign up for Dunkin’ Donuts’ rewards program, DDPerks: one on signup, one on your birthday and one every 200 points. One dollar equals five points, so you get a freebie every time you spend $40. If you’re buying a $3 coffee every day, you’ll get one in less than six weeks — and probably even more quickly, since you can also earn bonus points by taking advantage of special offers. Plus, it’s easy to manage your account — just check out Dunkin’s mobile app. You can even pay with your phone! OK, honesty time: This hack isn’t specific to Dunkin’ Donuts. Even if you’re going to ignore the rest of this post’s advice ( 🙁 ) and pay full price for your coffee every morning, you could be getting a better deal if you pay the right way. Buy a discounted gift card from a site like Raise. You might be able to buy a $20 gift card for just $15 — so you automatically save a nice percentage on every beverage, breakfast sandwich and donut you order. If you want to do even better, buy the discounted gift card — or just the goodies themselves — with a cash-back credit card. Even if it’s just 1%, you’re earning back real money when you spend with that card. Just make sure to pay off the full balance every month to avoid interest! Even if you’re not a Perks member (why, though? ), you can take advantage of coupons. Check your local coupon books and circulars for Dunkin’ Donuts coupons — and don’t forget to look online, too. Don’t chuck the receipt with your straw wrapper! Dunkin Donuts offers a free donut with beverage purchase to folks who fill out its customer service survey — and the code you need to access it is at the bottom of your receipt. You can also check out rebate apps and programs, which might reimburse you for some amount of your purchase price when snap a photo of your receipt. Although it isn’t active right now, Ibotta has had Dunkin’ deals in the past! If you qualify to be an AARP member, you’re in luck — you’re entitled to a free donut every time you purchase a large beverage. One pound of Dunkin’ Donuts coffee will cost you about $9. How many cups that’ll get you depends on both your brew method and what strength you take your joe, but it’s probably more than the number of beverages the same amount of cash would get you from the actual store. Bonus: You’ll get to skip the ridiculous drive-thru line and actually make it to work on time. Your Turn: How do you save money on Dunkin’ Donuts? Did we miss any awesome tips? Let us know in the comments! Jamie Cattanach (@jamiecattanach) is a staff writer at The Penny Hoarder. She drinks more Dunkin’ Donuts coffee than you do. No, seriously.